This is the first book in the Bess Crawford series. As a nurse aboard a WWI hospital ship, Bess Crawford feels a duty towards her patients. Some more than others, of course. Arthur Graham was one such patient. Well loved not only by Bess, but by the entire hospital staff, Arthur was a man Bess could have pictured herself marrying – had only he survived. But even now that he is dead, Bess still feels that she must respect his final wishes and deliver a cryptic message to Arthur’s brother Jonathan, “Tell my brother Jonathan I lied. I did it for mother’s sake, but it must be set right.” While delivering the message to the Grahams in Kent, Bess finds herself drawn first into two medical emergencies and then into the mystery of an old murder. All may not be as it seems at the Graham’s estate. In many ways, it is difficult not to draw comparisons between the Bess Crawford and Maisie Dobbs series. Both involve women who are or were WWI nurses, and both involve the solving of mysteries. Thus far, at least, Bess stumbles into her mysteries, instead of approaching them deliberately as Maisie does. In many ways, Bess is also more self-assured. Unlike Maisie she was born into the life of relative privilege and status she currently enjoys, and thus is not forced to work through the slightly angsty class mobility issues that Maisie has. It is, of course, not fair to A Duty to the Dead to only compare it to another series, though, it must stand on its own. It does this quite well, really. The story moves along believably; it would have been easy for Bess’s entry into the Graham family mystery to come off feeling contrived, but the events of the plot flow naturally and with the character traits that Todd establishes for Bess, it would have been less believable had she not gotten involved. The first books in long-running series occasionally suffer from too much desire on the part of the author to create the character and setting (I refer partly to Maisie Dobbs, the first book in the series of the same name, which almost failed to compel me to move ahead in a series I now adore), but Todd manages to work the setting and character development into the plot so that the story isn’t bogged down in the service of the following books. All in all, a strong and intriguing start to a new-to-me series. I can’t wait to read the next one! Recommended. I enjoyed this one very much, too – and I really liked the lady who read the audio version. I’m planning to listen to book two in April for the Bess Crawford read-along. I gave up on Maisie after the first book because I felt the mystery elements weren’t very strong, but I think I may have made a mistake. When I was reading your summary paragraph, I also was struck by how much this sounded like a Maisie Dobbs kind of book. It sounds rather interesting to me, and might be something that I should check out. Thanks for the really well-rounded and thoughtful review! I nearly made the same mistake with Maisie, you should definitely go back to it, the first book is the only one with so much backstory. I think the mysteries will be a but more subtle here as Bess isn’t an investigator like Maisie, but still very intriguing. I really really love Bess, and I mentioned (perhaps on Twitter) that Bess is almost like getting a glimpse of Maisie during the war. As you mentioned, she is more self assured, and I think a lot of that comes from her place in life but also because she has no Maurice in her life. Though Maurice is undeniably a good influence on Maisie, he also makes her question everything – in a way that can get annoying at times. (Though don’t doubt my Maisie love. In fact, I posted about her today). This series only gets better, and I cannot wait for the next one to come out. If you have a Nook, I have a couple I could share with you. I’m so glad you’re reading and enjoying Bess. I’m reading the second right now and it’s really very good. It’s funny you mentioned not being captured by the first Maisie book. I loved this first even though it wasn’t much of a mystery. I looked at it more of the character study. But then I adore the whole series, so I’m kind of bias. As for Bess, she’s going strong in #2. Although her involvement is not as plausible it’s still very believable. 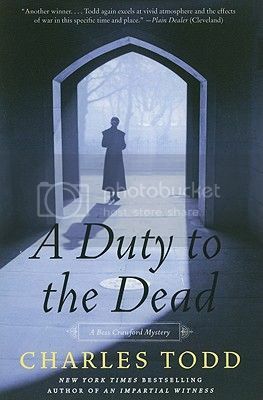 Can’t wait for the discussion of Duty to the Dead. I almost did the same thing with Maisie Dobbs. It was only until I read the second that the series started going for me. I am glad I am not the only one that felt that way! I really enjoyed this book. I started the sequel, but I haven’t spent much time on it yet. Have enjoyed every Todd book I’ve come across, including A Duty to the Dead. I have the first book in this series out from the library at the moment. I requested it because of the readalong but I knew that I wouldn’t be able to keep up with the schedule so I will just read at my own rate. I am looking forward to it though! I just ordered this book for a library patron the other day because he was looking for something to read while he waited for Elegy for Eddie, so it’s good to know he will probably like it. I didn’t go on with Maisie after the first book (audio version), but he liked the whole series a lot. I think I might prefer to try Charles Todd’s other series instead, myself.